U.S. Election forecasting guru Nate Silver's forecasting firm http://fivethirtyeight.com, that got the 2015 UK general election just as badly wrong as he the previous 2010, have been busy putting up a smoke screen of excuses as to why they got it wrong once more, as a case of when they get it right claim praise but when wrong blames others such as the opinion polls - Its your methodology stupid! Which several days before I warned would turn out to be badly wrong. 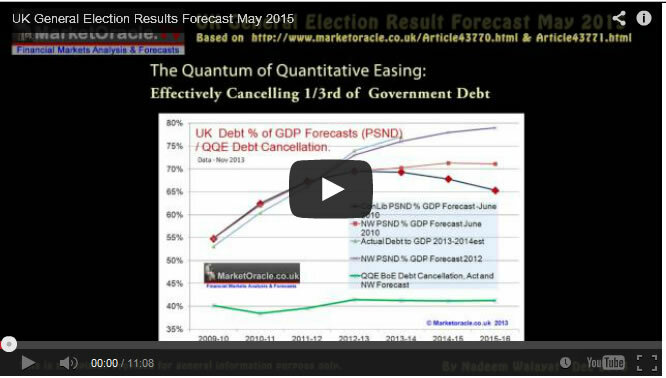 04 May 2015 - Nate Silver UK General Election Forecast 2015 as Wrong as 2010? The mainstream press has literally gone bananas on Nate Silvers UK election forecast as if he were Moses himself, who just like Ed Milliband on Sunday has descended from the Election Mountain with a prophetic stone tablet. This despite the fact that Nate Silver's grand finally forecast is of not much difference to what virtually every other pollster has been forecasting for several months now as illustrated by the below table. Which is not so surprising since the pollsters, including Nate Silver all base their forecasts on virtually the same opinion polls so all that Nate Silver stated was for a mundane middle of the road outcome of what most others have already been stating for several months! Which means if he gets it right then so will virtually every other pollster and that ahead of Nate Silver, which certainly is not worth the amount of coverage that it has induced. And it gets worse, for if the Nate Silver obsessed mainstream press had bothered to do their research then they would soon discover that Nate Silver got the 2010 UK General Election very badly wrong, not by just a handful of seats but that he literally forecast that the Lib Dems would get DOUBLE the seats they eventually did i.e. 113 forecast against 57 actual, as his expectations for the Lib-Dem surge never materialised and conversely the Labour Collapse to 198 never happened instead Labour won 258 seats and thus denied the Conservatives an outright majority. Therefore the whole Nate Silver UK election forecast mainstream press diatribe is pure hype over substance for it reveals nothing new to what the public were not already aware of. 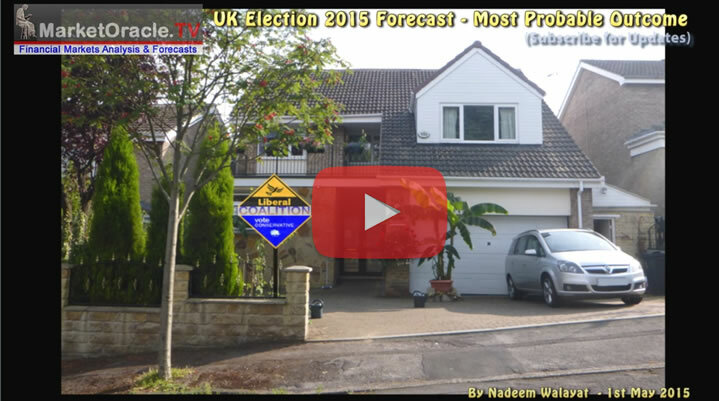 The key problem for forecasters such as Nat Silver is that it is no good just googling about Britain or hop on to a plane for a few days visit to understand Britain, which is why he does not understand UKIP nor SNP nor what is happening in the constituencies because he does NOT KNOW BRITAIN! This illustrates just how STUPID the broadcast media (BBC) and the mainstream press are. They might as well have flown to China and asked a village farmer what the UK election result would be, who I am sure after googling for a few minutes would come out with a very similar forecast to Nate Silver's near average of pollster forecasts. However, during election night, completely oblivious to what the exit poll was stating he continued to 'fine tune' his forecast so that it got even worse as the night progressed i.e. So as the night progressed http://fivethirtyeight.com's forecasts became even worse than where they started! You can read their blog for the whole fiasco of forecasts getting worse despite the actual results pointing in the opposite direction here. For what actually did prove extremely accurate in forecasting the UK general election 2015 outcome I turn to my analysis of December 2013 that is based on house prices rather than opinion polls, and as later featured in the UK Housing Market ebook (FREE DOWNLOAD) that converted the UK house prices forecast trend trajectory into expectations for an outright Conservative election victory where the only thing to do was to track actual house prices against the forecast trend trajectory to fine tune the expected result on approach to the May 7th election day. Therefore my analysis of UK house prices converted into seats by far proved to be the most accurate forecaster for the UK general election 2015 outcome, and since I have a good idea of how house prices will perform over the next 5 years I can tell you with some confidence that the Conservatives are also likely to win the 2020 general election! Though, in the interests of accuracy do come back to my detailed analysis to conclude in a seats forecast that I will probably publish a year or so before the next general election. Ensure you are subscribed to my always free newsletter for my in-depth analysis and detailed trend forecasts.